s the population of users increases, the Internet community is learning, like all pioneer societies, that the freedom the new environment offers must be enjoyed with responsibility and, as the society grows, within the framework of law. The problem has been deciding which laws apply to the international network. In the closest parallel in history, when an unprecedented confluence of indigenous and imported ideas met in the New World, those who confronted the problem of producing that new societys legal structure created a document of unprecedented wisdom  the Constitution of the United States of America. Now, as the Internet is rapidly outgrowing any scope ever envisioned by its founders, the Church of Scientology is among those working to ensure that the same rights, responsibilities and freedoms granted by the Constitution apply in cyberspace. In recent precedent-setting decisions in cases brought by the Church, the U.S. courts have greatly strengthened the rights of authors and publishers of copyrighted materials. One of the most recent decisions came in a case brought by Religious Technology Center (RTC)  the Scientology church that safeguards the purity of the Scientology religion. After receiving copies of stolen Church of Scientology scriptures  which he knew to be copyrighted, confidential and protected by law  Arnaldo Lerma of Arlington, Virginia, posted dozens of pages from the stolen scriptures on the Internet. The decision sets a precedent for the rights of all intellectual property owners and publishers, by establishing that the law applies as much to the virtual world as it does in other media. In her oral ruling, Judge Brinkema confirmed that the materials in question are validly copyrighted, and that if she were to sanction conduct and arguments such as Lermas, there would be nothing left of copyright protection. It was also shown by evidence filed with the court that Lerma admitted in deposition that he knew his copyright violations would result in a suit and that he invited such action. Lermas associate Larry Wollersheim compounded the damning scenario by admitting in deposition that insurance was purchased because they anticipated that their actions would result in litigation. Then Lerma and his associates went ahead and knowingly goaded the Church into a suit while they still had coverage because we didnt have enough money for the next months insurance. In short, Lerma had pre-meditated both the offense and its consequences. In addition to statutory damages for each violation, the judge also awarded attorney fees to the Church. 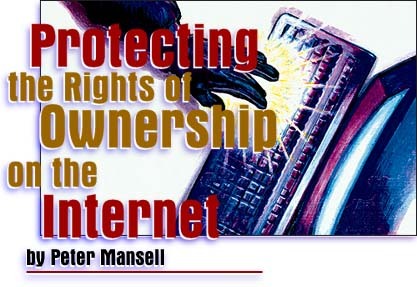 David G. Post, co-director of the Cyberspace Law Institute at Georgetown University, said, Unless this judge were willing to completely rewrite copyright law for cyberspace  a job that she is not entitled to perform under our legal system  the court ruling regarding the copyright nature of these materials seems to have been dictated by sound legal principle. Jonathan Rosenoer, an intellectual property lawyer and author and publisher of the Cyberlaw and CyberLex columns, agrees. The Internet will never expand if people dont have the ability to go to court and defend their creative works under a strong copyright framework. The Churchs cases are helping to develop it, he told Freedom. In a subsequent ruling which further bolsters the safety of copyrighted materials on the Internet, U.S. District Judge Ronald M. Whyte on March 29, 1996, enjoined a California man from engaging in cyberspace misappropriation and copyright infringement of Scientology scripture. Judge Whyte granted an injunction against Grady Ward of Arcata, California, preventing him and anyone acting with him from infringing on the copyrightsof RTC or otherwise misappropriating specified writings. According to a lawsuit filed only a week before the injunction was granted, RTC charged that Ward had engaged in a continuing scheme of copyright infringements and trade secret misappropriations. RTC repeatedly asked Ward to cease and desist from violating the copyrights, but Ward continued to post materials on the Internet in defiance of the law. In its complaint, RTC alerted the court to the fact that Ward had indicated in Internet postings that he was threatening, and poised to engage in massive violation of the copyrights. Like the materials at issue in the Lerma case, Wards unlawful postings were from a small but important part of the voluminous scriptures of the Scientology religion, which are maintained as confidential and protected by copyright and trade secret law. Judge Whytes order restrains not only Grady Ward but all persons in active concert or participation with him. Anonymous postings had occurred through remailers, who removed any means of identification from the computer posting before it appeared on users computer screens. RTC documented Wards ability to predict illegal postings on the Internet and accused him of using these as a stalking horse to attempt to destroy its copyrights. Another recent decision serves as a precedent for copyright holders and licensees who find their works posted on the Internet but are unable to secure cooperation from access providers in resolving the situation. A federal court has sent a clear signal to access providers that the idea that no one is responsible will not work. On November 21, 1995, Judge Ronald M. Whyte denied a motion for summary judgment brought by Netcom Online Services and a related motion by bulletin board operator Tom Klemesrud which sought to have them dismissed from the case on the basis that they were not responsible for the infringing postings of a subscriber who was enjoined by the same court in September. Netcom raised an argument common to many service providers  that they are comparable to a telephone company and thus cannot be held responsible for the content of their subscriber. Legal discussions aside, the service providers seem conveniently blind to the obvious flaw in the comparison: Telephone companies do not provide a service where copyrighted works  whether or not they have been previously published or even intended for publication  can be placed in permanent view of a potential audience of many millions, and can be unlawfully reproduced by the same number. The innocent telephone company analogy also fails because uncontroverted evidence shows that in more than 1,200 instances Netcom has taken action against individuals whose postings had violated a law, a rule or the norms of decency. Judge Whyte agreed. Because the access providers allowed infringing messages to remain on their systems and to be further distributed worldwide after being informed of them by the Church, the judge found that Netcom was a contributory infringer. What these decisions ultimately mean for the Internet is that its creative content will not vanish and that those who create or publish works will not be forced to avoid the Net for fear of seeing their works infringed. And that is vital for all present and future authors, creators and Internet users across the globe. © 1996-2008 Church of Scientology International. All Rights Reserved. For Trademark Information on Scientology Services.